I Me My: James Cameron's "Avatar" - A Heavily Funded Docudrama From a Tech- Savy Film Maker? James Cameron's "Avatar" - A Heavily Funded Docudrama From a Tech- Savy Film Maker? I watched the much awaited "Avatar" last weekend. James Cameron's blockbuster apparently cost 230 million dollars to make and is Cameron's first film since "The Titanic". Not much of a fan of sci-fi movies or of animation flicks, my expectations from this movie were pretty low. However, the title, "Avatar", intrigued me as did the mammoth spending on the film. What would those many million dollars bring to the screen? Well, the movie surprised me. It is a loosely spun docudrama that houses a chic lit romance that touts fable like messages. Cameron creates a world that is virgin, that is on the verge of a takeover by an alien species, the humans, who do not hold nature sacred and could exploit both the living and the inanimate to their selfish ends. They arrive on Pandora to mine and siphon out 'Unobtainium' that could fuel them on earth for generations. But, it would cost the Na'vi's, a native tribe on Pandora, their home, even their very existence. Cameron obviously had the Colonization of America and the tragic Native American saga on his mind when working on the script; the hostile takeover of a resource rich environment by a heartless people. So much for the documentary element in the movie, but that by itself could not have sustained the interest levels of the medley audience that the movie has attracted. The fairy tale romance between Jake in his 'avatar' and Neytiri, the Na'vi princess, made many hearts maudlin enough to suspend their disbelief for the entire stretch of the 2 hours 45 minute movie! Yet, there was still a part of the audience whose needs would not have been met if Cameron had not spent that 230 million and created the dream-scape that was Pandora; the 10 feet tall blue skinned avatars, the robots, the flying lizards, the barbie bodied Na'vi, the floating and luminescent flora fauna. The technical wizardry in the movie draws droves of youngsters daily to watch this film! Cameron with his 3D effects, the technical magic, and his masterful storytelling has all viewers glued to their seats; no questions asked! 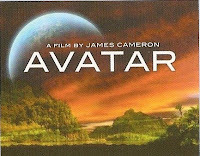 As George Lucas did with his "Star Wars", Cameron too created a magical world of his own in "Avatar" and called it Pandora, amid which he spun a heart rending tale reminiscent of another from the annuls of human history. In the tale he housed an inter-species romance that tugs at your heartstrings while sending the searing message that we humans can and would destroy any planet, even our own! I enjoyed the movie, and I would strongly recommend you see it because doubtless, Cameron would have made sure that "Avatar" has something in it for you! The only reason that stops me from going anywhere near this movie is the unduly hyped "Titanic"! Also this guy's sanctimonious claims on the "message" in avatar - "the powerful exploiting the powerless"
3 - Poverty/Penury of aborigins, tribals etc etc.. I feel animation by itself is the anti-thesis of creativity. When a programed software let's you create graphical illusions, what i feel is that it most evidently KILL the human skill & talent. I'm not a sci-fi fan, so I denied my husband company to the theatres. He returned awe-struck. Special effects aside, he thought the under-lying social and political messages were beautifully done. And yet, most people who recommend Avatar, still recommend it, not for the story or the plot, but for the visual wizardry that it is. Unfortunately, in Pakistan, we do not get 3-D. I hear a lot of hype for Avatar. I think I need to see it. Glad to see your review of this movie. I've been wanting to know if it was good or not.